This large finely modeled powerful sculpture of a chained Mastiff or fighting dog by Lecourtier was exhibited at the Paris Salon of 1878 and was one of his most popular subjects. The bronze is finely cast and the detail is exceptional even down to the working clasp on the chain attached to the dog's collar as well as the broken pottery bowl on the base under the dog. 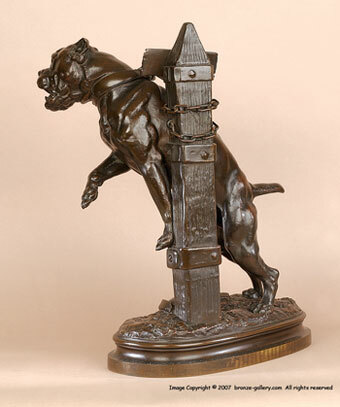 The sign on the post is in English "BEWARE OF THE DOG" showing that it was made for the British or American market. 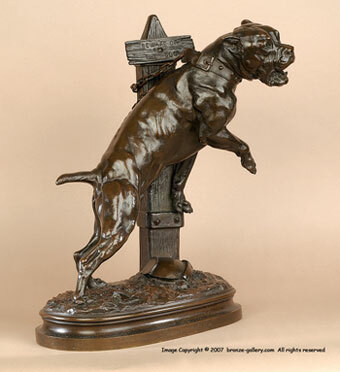 The subject of guard and and fighting dogs, the Mastiffs and Bulldogs, was very popular at this time all through Europe, England, and the United States. These dogs were the forebearers of the modern day pit bull terriers and a photo of this same model was used on the cover of Semencic's book "The World of Fighting Dogs" published in 1984. A large impressive sculpture that makes a statement in any room, and a special piece for anyone interested in the early bulldog breeds. The bronze is finished in a rich dark brown patina.